Savrola. A Tale of the Revolution in Laurania. - Sir Winston Spencer Churchill 1900 - Longmans, London - First English Edition	A clean, crisp copy in a beautiful recent leather binding. ‘For those who know of his later exploits, it provides an amazing foreshadowing of events in his own life. Though the plot is sometimes clumsy, there are flashes of poignancy in his prose that are deeply insightful for a man of his age.’	References: Woods, Bibliography of the Works of Sir Winston Churchill A3(b). 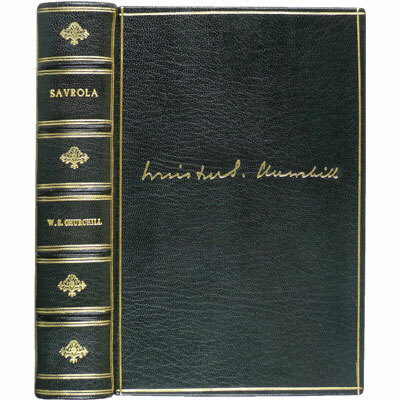 Langworth, A Connoisseur’s Guide to the Books of Sir Winston Churchill.